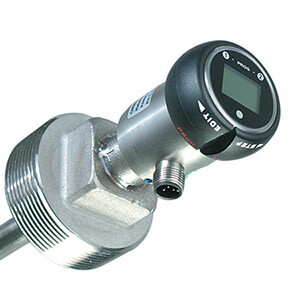 The LVR300 Series is a continuous level switch system with an integral LCD display and programmable alarms. The LVR300 series is offered with a vertical display or one on a flexible, extended "swan" neck. The LVR300 series resolutions are available in 1/4, 1/2, or 1". Download PDF file to see all available ranges. Mating M12 5-pin connector not included.